Every year, the school district that I work for partners up with a local developmental needs services & support organisation in order to compete in the annual Chicago Triathlon. Taking part in the Super Sprint, we get together to full out relay rosters so that these students can enrich themselves in a team-building, physical activity and have some fun outside in doing so. In 2017, I was approached to join this program by a member of the school district staff because they knew I spent my high school and college years competing in cross country and track. Knowing the motivation, I couldn't say no to this request. However, the invitation came with a twist - instead of legging out the 1.5 mile portion of the triathlon relay, I would be taking to the water in a swim just under a quarter mile. Here's the kicker, I can't swim. Well, I can swim... but only enough to prevent myself from drowning. While that seems like a recipe for disaster, I was assured that the course stayed close enough to the shoreline that Lake Michigan was barely up to my waist. Therefore, I was able to swim/aqua jog for the duration of my leg so that our partners could compete in the biking and running portions. Plus, it was a fun change of pace from my normal circuit of 5k's and road races with a fun group of people in a non-competitive atmosphere. All in all, it was a positive experience. This year, the program again found themselves in need of help and I was again asked to help out. The event took place yesterday morning and, to put it succinctly, it did not go nearly as well. This time, we had heavy rains all night leading up to the triathlon. The tide was higher and the water, which had been waist deep the year previous, was no up to my ears. While I could fake it the first time, I actually had to swim for it this go 'round since my toes barely scraped the sand. As I was flailing wildly, all I could think about was how embarrassed I was going to feel after being fished out by the teenage lifeguards on watch. Thankfully, it did not come to that and I was able to slowly (super slowly) make my way through all 0.23 miles of water. It wasn't pretty and I was being passed by people leisurely doing the backstroke, but I made it. But, this experience confirmed what I had been saying for years - I am simply not a swimmer. In order to calm myself as I slowly splashed my way through the course, I tried to think about anything else besides the distance ahead of me. The first thought that flashed through my mind involved the NASCAR driver that you see above - Scott Wimmer. Why did this random, not connected to triathlons in anway athlete pop into my panicked brain? Well, all you have to do is look at Scott's last name and his first initial: S. Wimmer aka "Swimmer." 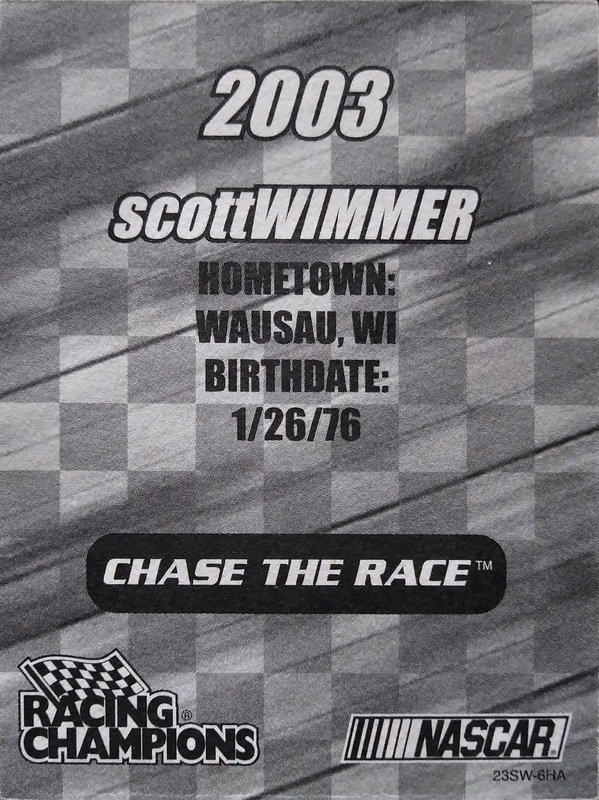 Scott Wimmer was an up-and-coming talent during the years I dove headfirst into the NASCAR scene. The Wisconsin native made his name on the local short tracks and the old ASA late model series before signing with Bill Davis Racing (BDR) to compete in the second-tier Busch Series. Both my father and I simply referred to this potential star of the future as "Swimmer" and this portmanteau amused us way more than it should have. When I decided to reboot my NASCAR card collection a couple of years ago, I was happy to recover this neon Racing Champions "Swimmer" single from a little-used drawer, making it one of the few originals that survived the purge of racing cards from my binders. Hailing from his "prospect day" in what is now the Xfinity Series, this mini card originally came paired with a 1:64 diecast model of his 2003 Stacker 2/BDR Chevrolet Monte Carlo. During the halycon days of my race fan years, I spent tons of my allowance funds on a diecast collection, so my racing card collection was made up mostly of these premium pairings. As you can tell from the scan of the card back, Racing Champions put far more effort into their cars than they did their cards. 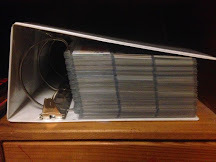 That said, today, that toy car has long since been lost to the sands of time while the corresponding card still represents Scott Wimmer in my All-Time NASCAR driver binder. Man - if you looked at that car without sunglasses, I'm pretty sure you could burn your retinas. It definitely stood out on the track! All in all, as I was bobbing up and down in Lake Michigan, I thought about how Scott's racing career was squashed by sponsorship problems. 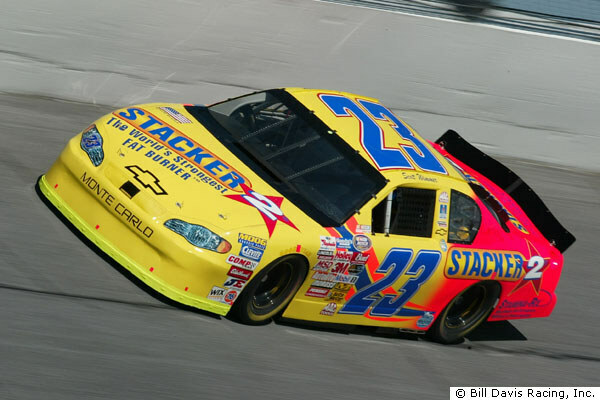 Despite showing his capability in high-end NASCAR competition, by the time he was promoted the Cup series to replace Ward Burton in the famous Caterpillar car, the once powerful Bill Davis Racing squad was barely staying afloat. A third place showing in his first Daytona 500 (2004) became his career highlight as the quality of his equipment diminished. "Swimmer" had the same problem when he moved on the Morgan McClure Motorsports, another former top-flight team that was scraping for cash and barely "treading water." 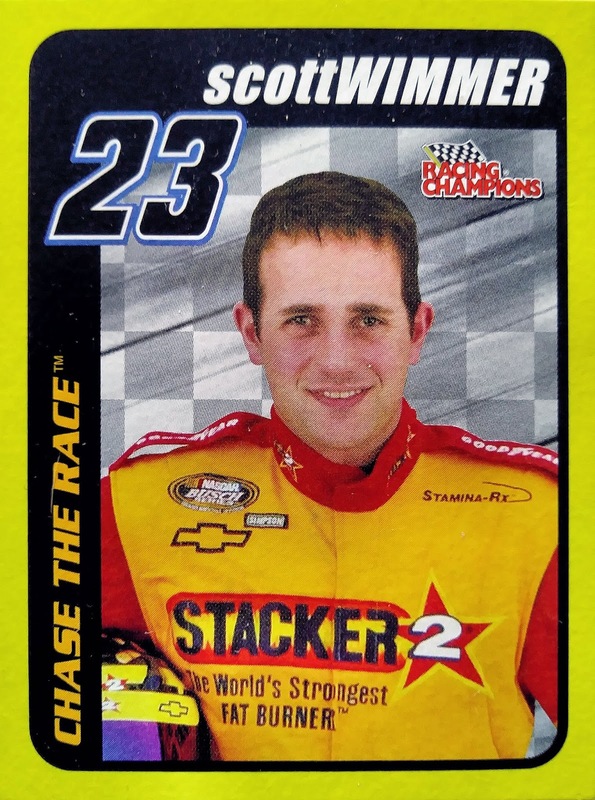 The once heralded prospect became a career journeyman, going back to the Busch ranks, and eventually moving from behind the wheel to the spotter's stand. Anyway, this is what I was thinking about as I struggled to swim a quarter mile through the cold waters of Lake Michigan yesterday morning - Scott "Swimmer" Wimmer's NASCAR career. This is how my brain operates. I guess it worked though, as I was eventually able to make it back to the beach and hand off my timing chip to the biker on my team's roster. No need to call in the teens! However, I think it's time for me to officially retire from triathlons... or at least practice my swimming form. Either way, I now have another full-year to decide on one of these two options. Thanks for saving me, "Swimmer!" SuperSprint Triathlon, huh? I'm not a swimmer either. Not even close. 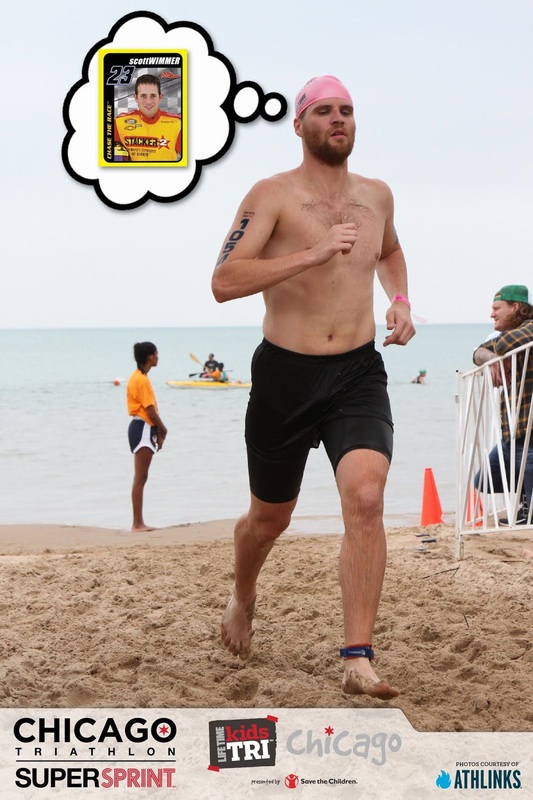 I've always wanted to do a triathlon, but the water portion is what's holding me back. I wasn't expecting to see NASCAR in this post, and not only did I get that, I had a good chuckle as well, thanks to your built in humor. I actually laughed out loud at a few points! I can't swim either, nor can I float, which doesn't make sense due to how fat I am, haha. I enjoy swimming in a pool, but a triathlon is completely a different level. Hats off to you for doing something out of your comfort zone. Or should I say swimming caps off.